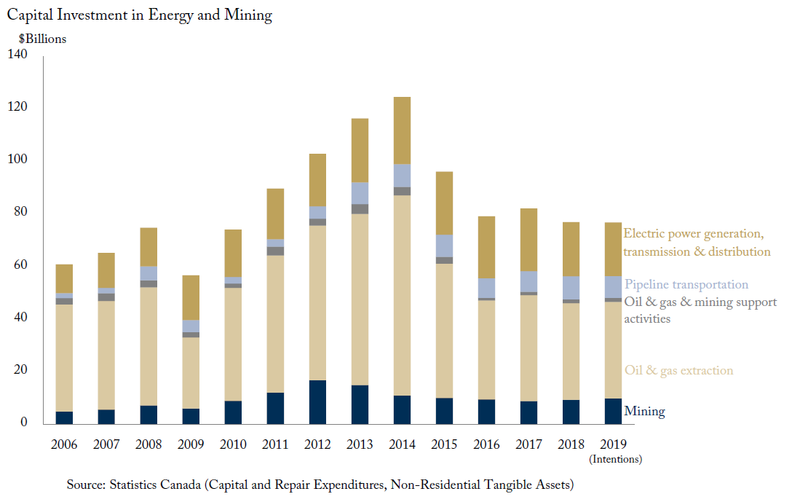 In this edition of Graphic Intelligence, we show the annual size of capital investment in Canada’s energy and mining sectors over the past decade, as well as investment intentions for these sectors for 2019. Capital investment in Canadian energy and mining has declined significantly since 2014 and intentions for 2019 forecast a continued sag in investment. Annual capital expenditures in energy (including oil and gas extraction, pipelines and electrical power) and mining fell from $125 billion in 2014 to $75 billion in 2018. This decline is equivalent to roughly 20 percent of total capital expenditures across all Canadian industries in 2018. The plunge of investment has been particularly deep for oil and gas extraction and pipeline projects. With investment in Canada’s resources sector already depressed, the federal government’s proposed Bill C-69 risks further discouraging of investment in the sector: the proposed legislation could increase uncertainty for many project proponents by widening the set of projects that face subjective determinations by political decision-makers and mandating that assessments include broad public policy questions (e.g., Canada’s climate change commitments). To learn more about capital investments in Canada’s resource sectors and the impact of the proposed Bill C-69, read “A Crisis of Our Own Making: Prospects for Major Natural Resource Projects in Canada,” by Grant Bishop and Grant Sprague.